“This has become a huge rallying cry for her critics. The president’s video which includes video of the Twin Towers falling and splicing her words ‘some people did something.’ You see those saying that goes beyond the pale. If you want to have a conversation with her, that’s one thing. But using images of 9/11 they say, A, is wrong and B, could incite violence,” CNN host John King said. 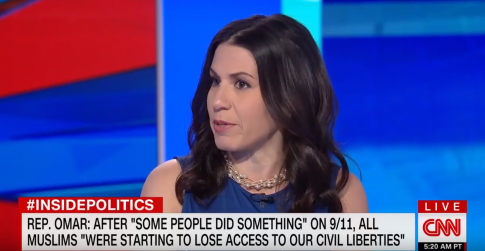 “Especially when your criticism of Congresswoman Omar is she’s being too lighthearted about 9/11, to then cut and splice that video together, seems like it’s using that to make a very, very questionable political point,” Demirjian said. “Before Trump started piling onto Congresswoman Omar who does have things to be concerned about, her commentary, her comments she was accused of being anti-Semitic and the other slips of the tongue she’s made because she keeps failing into these traps, this is an issue dealt with by the Democrats. The post WaPo Reporter: Omar Keeps ‘Falling Into These Traps’ With ‘Slips of the Tongue’ appeared first on Washington Free Beacon.